Businesses have called their customers using auto dialers and telemarketing for years. But with proactive customer contact (PCC), companies are now building creative applications that leverage customer and product information from across the enterprise — to extend personalized messages and sales offers that grow customer relationships and enhance loyalty. 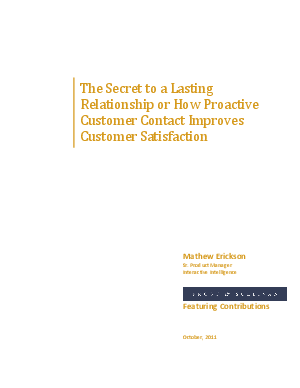 Read what companies are doing to make PCC initiatives an integral part of their unified communications and customer retention strategies, from Mathew Erickson, senior product manager for outbound solutions at Interactive Intelligence, with contributions from analyst firm, Frost & Sullivan.